1. We can do away with any notion that the Vms' drawings are the work of a European 'artist' or even of a European architect. The dates 1404-1438 (give or take a couple of years) set the Vms in a period before the 'artist' was other than an artisan, who learned his craft from the basics up, and it is a basic law of iconography and provenancing that muscle-learning cannot be unlearned. In other words, just as someone who spent ten years in school, hand-writing every day cannot get their hand to 'unlearn' how to write, even if they try to imitate a baby's efforts, so too no-one who had been trained in medieval Europe as a painter of manuscripts, paintings etc. could undo it. Same for a Renaissance architect - who could not 'forget' how to think in terms of three-dimensions and perspective. Similarly the artisan was not trained to indulge in 'self-expression' and such importance for an individual was hardly stressed in the way we imagine natural today in our own society. 2. Professional techniques co-incide, not overlap. That is, a scribe might use herringbone stitch to mend a parchment, and a seamstress might use the same technique for a hem, but that doesn't imply that either had any knowledge of the other's professional-technical area. (i) building - making pretty patterns on the exterior by adding one or more layers of paint or render and then cutting through or scratching to create patterns: we'll call that architectural sgraffito. It has a long tradition in the west, but though very often imagined responsible for every use of sgraffito in Europe, it was quite a separate thing - a folk-custom, pretty much, which some Renaissance people picked up again for their buildings because they imagined it a relic of ancient Romans or Greeks.... which in a way it was. (iii) painting: though we find folk-art use of e.g. drawing through varnish or through paint - notably in Spain, sgraffito really came into its own in European painting during the 'Mongol century' as the newly-opened routes east brought in return - principally through Genoa and, to a lesser extent through Venice, the most stunning fabrics made of silk-brocade, gold-woven brocades and various others whose technical names I won't bore you with, though the merchant books distinguish them. Fabrics weren't 'girly stuff' in those time, and the greatest volume of all traded commodities across borders apart, perhaps from slaves, were fabrics. Trade in fabrics, both inter-regional and international was the most phenomenal money-maker. Bigger than spices, and bigger than jewellery or food. And that importance is part of the reason that the precisely accurate depiction of fabrics was demanded by the patrons. In Cennini's book - meant for apprentices - he doesn't use the word sgraffiti when explaining how to render brocade and has to describe the sort of thing he means, but by the time of Vasari's handbook, Vasari doesn't bother describing it and assumes his reader knows what it is, and why it is done. (iv) a fourth type of sgraffito was used to aid adherence of gold ink or gold-leaf to vellum or parchment . (If you want to find out more, the search term should be 'chrysography'. It seems to me that whoever scratched the pigment in folios of the Vms either did so accidentally - as may well be the case - or they did so quite easily because they had been accustomed to scratching pigment - as a technique used in one of those four professions. Sgraffito in Renaissance painting is one stage within a series of technical stages, so that it is embedded within a complex process that involved layers of gesso, egg binder, gold leaf and pigment. It isn't 'scribbling' and it was never casual or purposeless. Not as it appears in the Vms. This is as long as a blogpost, so I'll cut it here. I don't think the Vms sgraffito is the work of an accomplished Latin EUropean artist; it could be the work of a scribe, but if so why should be employ a technique which had little purpose in Byzantine or Latin manuscript art apart from when writing in gold? I don't think anything in the manuscript justifies attributing the sgraffito to a builder's labourer. So that leaves us - temporarily anyway - with ceramics. ceramic artists were brought in to work on early Renaissance paintings. You are not allowed to view links. Register or Login to view. (also shows Sankai glaze). 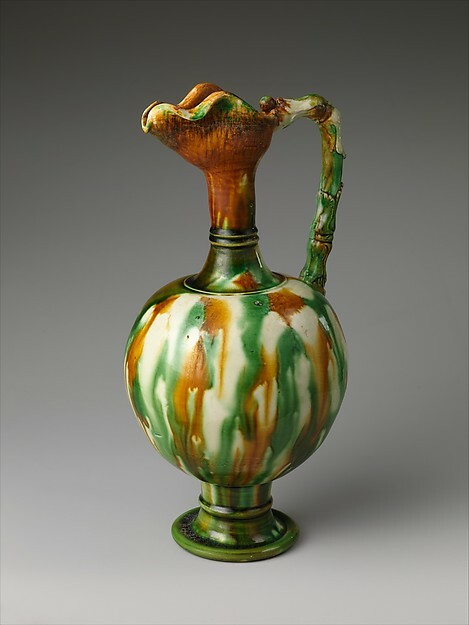 the link to Pelling's blog is because that post contains the illustration that told me we might be looking at Sankai glazed ware. If we come even as far west as Corinth, the date is most probably 13thC-earlier 14thC... which is exactly the period to which most of the early appraisers assigned Beinecke MS 408. So if it were Sankai (I reasoned back then), the chances were that we'd been looking too late, and too far west, for the informing sources. Nick's illustration proved very helpful in pointing me to the right time-frame for the current manuscript's near exemplars. Well, that's the barest bones of the matter. Note how the definition of sgraffito shifts, depending on the professional environment. This definition is for high-art work using gold-leaf. Interesting, I didn't know the term but it still seems popular, especially in ceramics. I can see how familiarity with such a technique could lead to a scribe scratching in the paint. But the apparent lack of a clear purpose makes this hard to prove. How can we know the scratches weren't made by accident? Or by a later owner? Also, scratching a surface is one of the earliest forms of art (think prehistoric rock art and sculpture) exactly because it is so easily accessible. I'm not entirely sure which part of the MS you are referring to here, Diane. Which pages are these scratches on? Which she interprets as showing Sankai (or Sancai) glazed ceramic (on the right). Personally all I see here is more sloppy paint application (possibly also poor paint preparation) by the person who added the blues and greens, as is consistently displayed throughout the Voynich manuscript, not just in the containers. As for the scratches shown by Searcher in the other thread, I don't see what they might have to do with sgraffito. The majority of the scratches we see in the manuscript are not on painted parts, except for the 94r one. There is zero indication about WHO made the scratches or WHEN these scratches could have been made. They could have been added decades or even centuries later. 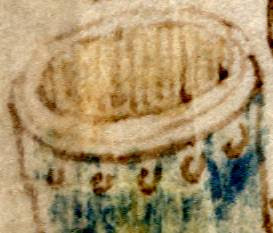 If the idea is to stick to facts and evidence, undated scratches cannot be taken as evidence of provenance or to make inferences about the people who created this manuscript. I have a genuine antique Sancai 三彩 horse. I also know ceramics, wheel throwing, and glaze chemistry well enough that I have taught it. Zooming in on a small area of one of the containers might look a bit like Sancai glazing, but looking at the containers overall and how they are drawn and painted, I really don't see any evidence of these being Sancai-glazed items and I doubt that they are ceramic. I must agree with VViews that the thick blue is generally very messy and shows patches of various different colors. It might even mean that other colors have been overpainted with it, as has been suggested. And also, of course, on the fact that we don't know who made the scratches, when, how and why. Made when the ink was still wet, or does it look like this because of the surface of the parchment? In the first case, it would at least imply that the scratching was done together with the application of the strange dark paint. I don't think the Vms sgraffito is the work of an accomplished Latin EUropean artist; it could be the work of a scribe, but if so why should be employ a technique which had little purpose in Byzantine or Latin manuscript art apart from when writing in gold? I don't think anything in the manuscript justifies attributing the sgraffito to a builder's labourer. So that leaves us - temporarily anyway - with ceramics. Indeed, ceramics is a very interesting thought, as for me. 4) abundance of the circular diagrams ornated with many different patterns. It is really interesting why any usual herbalist, phisician or alchemist would depict such not so important details along with some inaccuracy in the other ones which seem to be more necessary. Maybe, my further conclusions are not that point you led, but I need to share it. So, I quite agree, maybe, this handicraft is really reflected here, in the VMs, as a part of life of the author, his professional habits or influence of the family business. By this I don't mean that the Voynich patterns are meaningless and only play the role of decoration. As far as I can recall, Nick Pelling first brought to notice the presence of sgraffito in the ms. I can't see any mention in his blog or in the first mailing list, so I suppose it was a reference in his book. Searcher's recent post brought the point again to mind. The manuscript is replete with details significant for accurately provenancing the pictures' content and the single greatest difficulty I've encountered in providing formal commentary and contextual material online, is the fact that the idea is so widespread that (a) art is 'easy' and universally accessible and (b) that everything I say can be nothing more than personal impressions or internet gleanings from wiki articles etc. My training began in 1975. I retired 18 months ago. Throughout that time and even now, I doubt that I've spent more than two or three days a month when I wasn't studying because we cannot grasp the significance of a detail without having an existing background against which its significance becomes clear. You know, it wasn't just guesswork or accident or subjective impressions that allowed me to see the astronomical significance and historical setting for the 'cross' detail in one folio or of the plant-heads in f.33v. etc.etc.etc. What I'm trying to say, then, is that we are not competing with each other for 'reputation points' on this forum, but to correctly understand more about this manuscript. What I want to add to that is that is that IF the scratches are deliberate - which might be impossible to determine, even at first hand - then the presence of sgraffito is significant. I've mentioned 'sankai' glaze with reservation, too, because I've not troubled to look into it other than noting that sankai would be compatible with other details. For example, even in that same piece, the style for the rim - and the ring of circles (actually bosses) - are quite right for Asian ceramics, and the ring of bosses is positively incompatible with i theories of an all Latin Christian provenance for the content. I understand that such information and comment as I have provided denies the validity of theories to which many have invested not only time and effort but something of their self-esteem, and that others cannot see why anyone's opinion should not be considered as good as anyone else's. But there are very few professions where that sort of equality applies, and iconographic analysis isn't one. So, about sgraffito - I can give anyone interested in what it could mean (if the scratches are deliberate) a reading list as long as you like. the fifteenth century is rather later than we usually date the advent of eastern influence on Latin works. The effects are seen from the late twelfth century in some areas, and some media but the usual dates are given as 1258-1350, by which time it is not at all uncommon.